As President and Chief Operating Officer, Tim Hingtgen is responsible for strategic and operational priorities of the Company and provides direction to the division and regional presidents who directly support our affiliated hospitals. In 2017 Mr. Hingtgen was elected to our Board of Directors. He is a highly accomplished hospital operator with a track record of successfully optimizing hospital operations and developing regional healthcare networks. Hingtgen joined Community Health Systems in 2008 as a Vice President of Operations. 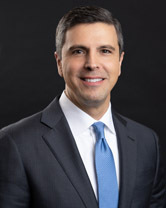 In January 2014, he was promoted to President of Division IV Operations, and in May 2016, he was promoted to Executive Vice President of Operations. Prior to joining Community Health Systems, Hingtgen served as a chief operating or chief executive officer of hospital facilities affiliated with other for-profit hospital systems. Hingtgen holds a bachelor’s degree in business administration from the University of Iowa and a master’s degree in business administration from the University of Nevada-Las Vegas.